Chang, a former Beijing correspondent for the Wall Street Journal, explores the urban realities and rural roots of a community, until now, as unacknowledged as it is massive China s 130 million workers whose exodus from villages to factory and city life is the largest migration in history. 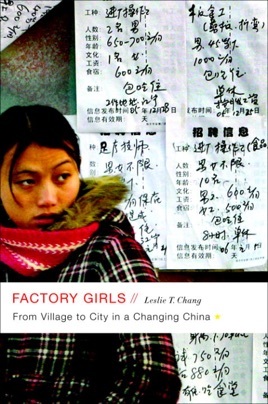 Chang spent three years following the successes, hardships and heartbreaks of two teenage girls, Min and Chunming, migrants working the assembly lines in Dongguan, one of the new factory cities that have sprung up all over China. The author s incorporation of their diaries, e-mails and text messages into the narrative allows the girls with their incredible ambition and youth to emerge powerfully upon the page. Dongguan city is itself a character, with talent markets where migrants talk their way into their next big break, a lively if not always romantic online dating community and a computerized English language school where students shave their heads like monks to show commitment to their studies. A first generation Chinese-American, Chang uses details of her own family s immigration to provide a vivid personal framework for her contemporary observations. A gifted storyteller, Chang plumbs these private narratives to craft a work of universal relevance. A fascinating read. It has helped me to understand more about many of the people who cross my life on a daily basis. I see them in the service industry. They work in my hotel and in the bars and restaurants that I frequent during my stays in Shenzhen. Many of these people started in a factory and eventually moved on to better work. If you frequent the South of China and want to know more about the people, then start here with this book. The author has an insiders view of life and the aspirations of the rural migrant worker.